Hear ye! Hear ye! 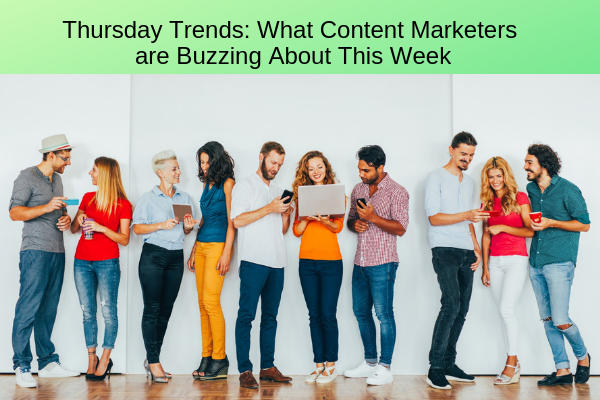 Thursday Trends bringeth thee content marketing commandments, content curation, the ultimate guide to content marketing, and loads more to make your content sizzle. Behold! Herein lies the laws of thy content marketing landscape. With content finding its rightful place alongside advertising and PR, its time that someone from upon high – in this case, Entrepreneur – establish rules for precisely what content marketers need to rock their campaigns in 2019. This article is a sensational guide for newbie and veteran content marketers alike. This list of eight guidelines covers everything from strategy, to using the most effective voice, to getting ahead of the competition. Oh, and please read before you do #7. If you feel like your content is tapped out, then curating your content can unearth a treasure trove of valuable material. The folks at WriterAccess pulled together some excellent tips for content curation to enhance your content marketing efforts. This piece breaks down what content curation is and its benefits — also covered are five reliable tricks for updating content, making it the most relevant to your audience, and how to produce on a schedule that will keep consumers intrigued. Can you guess what percentage of your content should be curated regularly? Find out here. Undoubtedly, you’ve perused a few trends lists already this year. In this piece, Forbes gathers a dozen content marketing industry leaders to weigh in on the critical trends that are most relevant in today’s saturated market. With technological evolution shaping how audiences search for and consume content, these trends are crucial for your content marketing strategy. Forbes covers the changes in how people search, what’s replacing written material, what written content ranks best, and how best to leverage influencers and video. Incorporating one or two of these trends into your strategy this year will have a massive impact on your audience reach and sales. And the best way to reach that one person is by creating a persona for your audience. A persona is a human with a name (like Digital Dave), a specific problem, feelings, and a need for a solution. Your solution. In this article, Search Engine Journal brilliantly details the five steps to knowing your audience’s persona so you can nail your content and motivate your audience. When “ultimate guide” is in the title, you know you’re in for a ride. (See #11 on Forbes list above.) And Thrive Global doesn’t disappoint in this definitive article with infographics included. This excellent guide is a mini-course for everything content marketing and a must-read if you’re looking to ignite your strategy in 2019. Dina R is a writer, life coach, and yoga instructor with 10+ years experience writing online business, article, and newsletter content. Articles have been syndicated and featured on MSN Lifestyle. Niche specializations and experience in dating, relationships, yoga, fitness, and healthy living.